A fully ice-sea coupled AO-FVCOM was first validated under climatological conditions and the under the real-time hindcast simulation from 1978 to 2013. 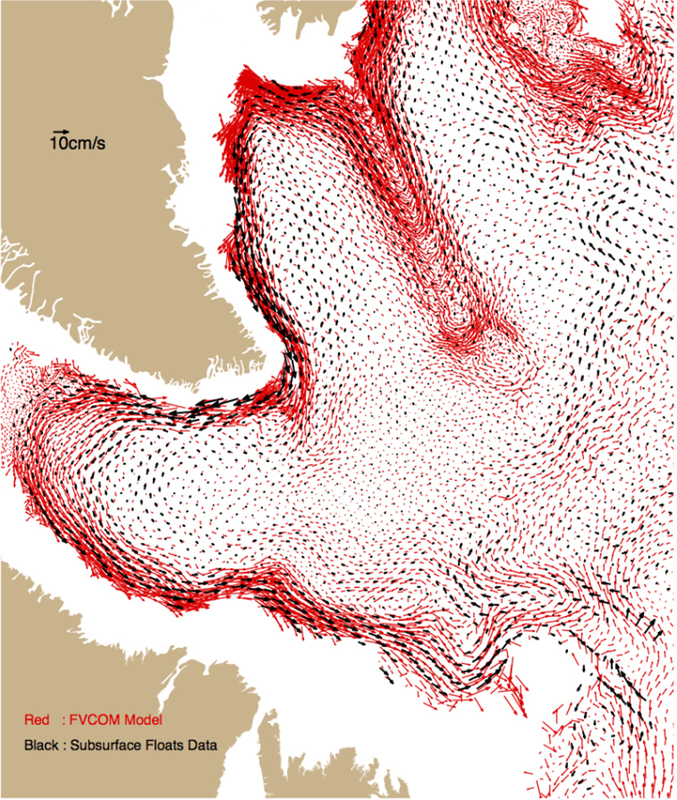 We also collected all available current, surface drifter and float data in the Arctic and adjacent oceans, and used them to validate AO-FVCOM in six regions defined as I) Bering Strait, II) the Beaufort Sea, III) Fram Strait, IV) Canadian Archipelago, V) Greenland and Labrador Sea shelf, and VI) the North Atlantic Ocean/Greenland Sea. As examples, some of the comparison results and animations are displayed here. An animation of the ice-current interaction-induced eddies over the Alaska slope in the Beaufort Sea. 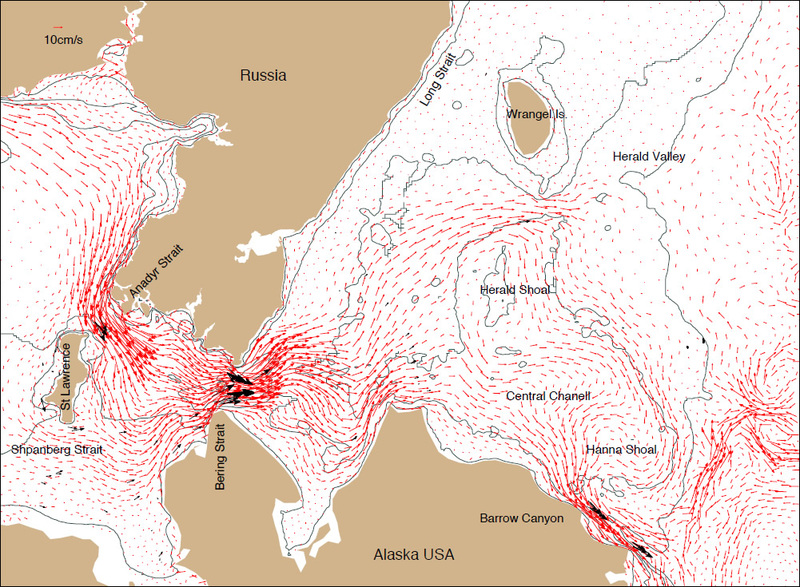 In region I – the Bering Sea-Bering Strait-the Alaska coast, AO-FVCOM captured the spatial distribution of subtidal currents (Fig 3). The Pacific Ocean water flows around St. Lawrence Island and enters Bering Strait Sea. The inflow of Bering Strait produces a northward current over the Chukchi Shelf and then separates into three branches: 1) a coastal current along the Alaska coast toward Barrow Canyon, 2) a northwestward current toward Herald Canyon, and 3) a relatively weak middle branch toward Hanna Trough. This last branch turns clockwise to join the Alaska Coastal Current. The model-predicted currents match well with observations in both magnitude and direction (Coachman et al., 1975; Roach et al., 1995; Weingarter et al., 1998; 2005). The coastal current jet around Barrow Canyon is caught well by AO-FVCOM. Black arrow: observed; red arrows: simulated.Click the image to view a full size one. Region-III is characterized by the North Atlantic inflow around Svalbard and the Arctic outflow from the Greenland shelf. AO-FVCOM captured these two flows and even the cross-strait current observed at current meter moorings (Fahrbach et al., 2001; Schauer et al. 2004). 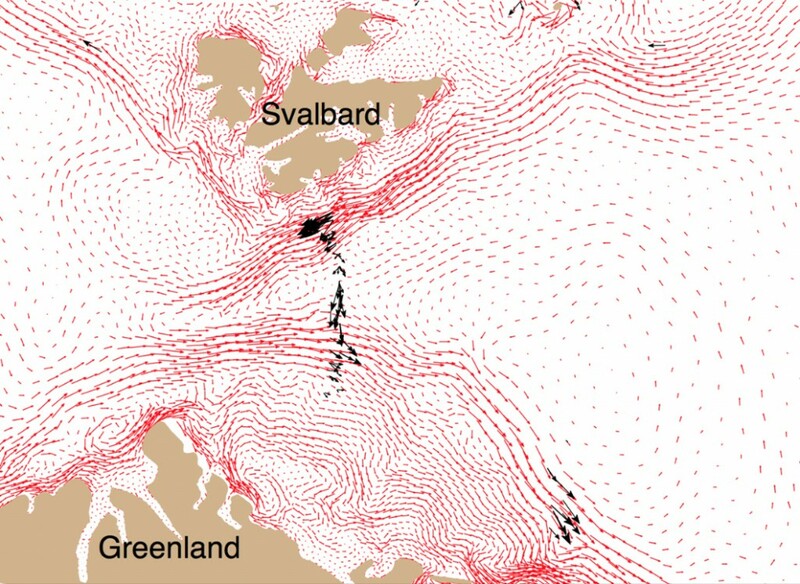 In Fram Strait, the net transport is determined by how accurately a model can resolve the current shear of the North Atlantic inflow and the Greenland Sea coastal outflow (Fig. 3). Maslowski et al. (2004) compared estimates of the annual mean net transport from models and observations and concluded that exisiting models showed a net southward transport of 0.5 to 3.2 Sv, while observations suggested a bigger value of ~4.2 Sv or up. We found that as the horizontal resolution in AO-FVCOM around Fram Strait is increased, mesoscale eddy features begin to form in the shear zone between the North Atlantic inflow and Arctic outflow. The net transport is ~2.8 Sv for the case with coarse resolution and converges towards ~1.7 Sv for the case with fine resolution. Using the fine resolution results, we next examined the sensitivity of the net transport estimates made using different across-strait moored array sampling configuations (e.g., the 10-km spacing used by Schauer et al., 2004), and found that the net transport can vary by up to several Sv for different sampling designs. The vertical resolution in the observations is also important since the AO-FVCOM predicted currents exhibit a significant vertical shear with depth. A comparison of AO-FVCOM-simulated and float-derived currents at a depth of 700 m.
Black arrow: observed; red arrows: simulated. Click the image to view a full size one.